✔ 15″ Deep Pockets with an elastic band that goes all the way around in the fitted sheet, which keeps the sheet on the mattress. They launder well and come out beautifully, no pilling and no excess lint. 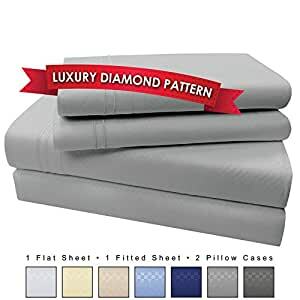 ✔ Ultra-soft polyester microfiber blend with a durable and breathable weave offers a surprisingly sturdy feeling and a comfy and relaxing sleep. ✔ Hypoallergenic and resistant to Dust Mites Wrinkle Resistant Stain Resistant Pilling Resistant. Ample amount of drop on each side of the bed on the top sheet so tucking the sheet while making the bed is easy. Plus there is plenty of top sheet to go around so you don’t have to fight with your bed partner over getting enough of the sheet to cover up. ✔ Sheets look crisp and neat straight from the dryer. They give you a fresh sheet, super soft, and silky feel even days after changing the bed. The sheets don’t wrinkle and the warm textured pattern is really inviting. ✔ Our sheets have wonderful subtle weave pattern that is beautiful, looks and feels extremely expensive. BACKED BY My Perfect Nights Brand – No Questions Asked Money Back Guarantee. If you aren’t 100% satisfied, simply return it at any time! Best in the Business Lifetime Warranty! There is nothing better than climbing into a freshly made bed with clean, crisp and super soft sheets. That cool feeling is magic to the skin. Never again have to fight with your spouse or bed partner over getting a little corner of the sheets. These sheets are extra wide so there is plenty of sheet to go around. Our super-elastic band that goes all the way around the fitted sheets keeps it on the bed no matter how much you toss and turn. THE PERFECT SOLUTION TO LUXURIOUS AFFORDABLE BEDDING. Luxurious and ultra-soft â¢ Durable, breathable weave â¢ Keeps you cool on hot nights, warm during cold nights â¢ Wrinkle resistant, stain resistant and pilling resistant Made of ultra-soft polyester microfiber blend , Easy care machine washable these sheet sets offer cuddle-worthy comfort that turns any bed into a relaxing retreat. With a durable, breathable and wrinkle free weave, you’ll sleep cool during hot nights and warm on cold nights. Care is super simple. The polyester microfiber blend is hypoallergenic and wrinkle resistant. Sheets look crisp and neat straight from the dryer. BACKED BY My Perfect Nights Brand – No Questions Asked Money Back Guarantee. If you aren’t 100% satisfied, simply return it at any time! Best in the Business Lifetime Warranty!